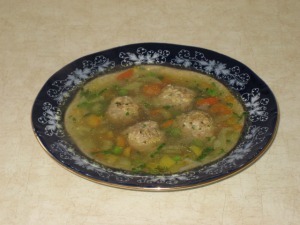 This chicken meatball soup recipe is tasty yet low in calories. It makes a family friendly dish which appeals to both young and old and seems to be a favorite even among the pickiest of eaters. Another plus is that this tasty dish is perfect to serve any time of day and what better way to get the kids to eat a healthy yet fun meal. Put all above ingredients into a bowl and mix thoroughly. Shape the mixture into round balls about 1 tablespoon in size each. Bake on greased baking sheet in oven at 400 F for 20-25 minutes. 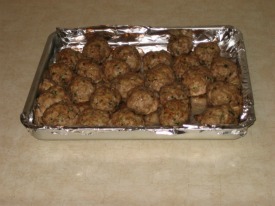 Put meatballs aside for later. In a soup pot, add the chicken broth and water. Bring liquid to a boil. Add in onions, celery, carrots and spices, reduce heat, cover and simmer for 10 minutes. Then add red pepper, frozen peas and the prepared meatballs into the soup. Again cover and simmer for about 5 more minutes. When the soup is done add the fresh parsley, salt and pepper to give it flavor. Having trouble getting your kids to eat soup? Make this soup an enjoyable meal for the kids by adding their favorite pasta. You can add a cup of cooked pasta to this soup, the kids will love it. Add macaroni or even swirly shaped egg noodles of their choice. Cook the pasta according to the instructions provided as all pasta has different cooking times, then add pasta to soup. Try to incorporate nutritious meals and snacks from the earliest age possible. The biggest hope you can have is that they will like most of what you make. This will get kids eating healthy before they get saturated by television commercials and other kids at school that may influence unhealthy food choices.